This—our 35th Neighborhood Letter—is a short one. I’ve got one of those long “Ramblings” in the oven, but it isn’t fully baked. (BTW: We have evidence that some of you actually read those Ramblings and don’t just use them as a cure for insomnia.) We are sending this shorter letter because we thought you might want to know about some of the special things we have cooking over the next few months. We are honored that you choose to visit our places and that you opt to hear from us. If you don’t want to get these letters, please email us at qwrhinfo@qwrh.com. Conversely, if you wish to receive more frequent news, please sign up on any of our websites. Also, we love feedback. (Feedback: Breakfast of champions! Please help us stay well nourished!) Please send yours to qwrhinfo@qwrh.com. Oh…and, if the spirit moves you to share fond memories, please consider putting your stories on websites such as tripadvisor.com. Just an aside: Using the pronoun “we” seems most appropriate because, though I (Dennis) write these letters, many people contribute to them..
Let Us Do the Cooking! Here are some options that will help you take it easy and spend more time with family and friends and less time in the hot kitchen. 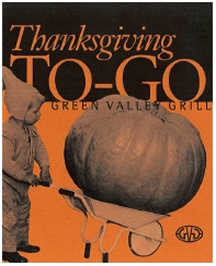 GVG Thanksgiving-to-Go Orders: Place your orders by 10 PM on Monday, November 21, then stop by on Thanksgiving Day (10 AM – 3 PM) to pick up your juicy, wood-fired rotisserie-roasted turkey with all the trimmings prepared by Green Valley Grill Executive Chef Leigh Hesling and his culinary team; along with your choice of sides, salad, bread and dessert. To place your order online, visit greenvalleygrill.com or call (336) 854-2015. Get Lucky & Go: Call Lucky 32, order from our regular menu or one of our “family meal” options, then we cook and bring your order right out to your car. Please see our “Get Lucky & Go” menu at lucky32.com. Holiday Dining: Dine with us. Green Valley Grill and Print Works Bistro are both open noon – 8 PM on Thanksgiving and Christmas Day (serving their dinner menus plus a special “traditional favorites” menu), and their bars remain open until 10 PM. Print Works will also serve breakfast from 7:30 – 11 AM. At Lucky 32 Southern Kitchen, we’re open on Thanksgiving Day in Cary from 11 AM – 7:30 PM, and in Greensboro from noon – 8 PM, serving our regular menus plus a traditional turkey plate. Both Cary and Greensboro Lucky’s will close at 3 PM on Christmas Eve and be closed on Christmas Day. Afternoon Tea: Afternoon tea at O.Henry Hotel has become such a popular tradition during the holidays that we are extending our hours. Currently, our regular tea hours are Friday, Saturday and Sunday, noon – 5 PM; Monday – Wednesday, 2 – 5 PM; and Thursday, 2 – 3:30 PM (ending earlier to accommodate set-up for the always well-attended Thursday Night Cocktails & Jazz). From November 28 to December 31, we will serve tea from noon – 5 PM, and Thursday afternoon tea hours will be from 11 AM – 3:30 PM. For reservations, call Green Valley Grill at (336) 854-2015. 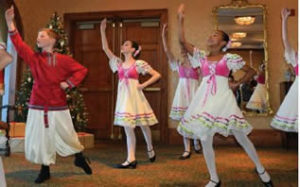 Nutcracker Tea at O.Henry: This holiday tradition is wildly popular! Treats inspired by dreams of dancing sugar plum fairies, toy soldiers and waltzing flowers will accompany your choice of seasonal tea, warm apple cider or hot chocolate. Children will enjoy decorating gingerbread houses, making holiday crafts and watching vignettes from “The Nutcracker” performed by the Artistic Motion Dance Company. 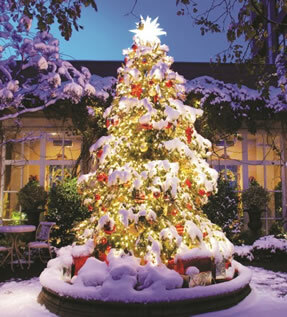 Afterward, join Clara by the tree as she reads “The Nutcracker.” November 27, December 4, 11 and 18 at 11 AM and 3 PM. Reservations are filling extremely fast, so please call (336) 854-2015 soon to guarantee your spot! $48 per person for adults and children, plus tax and 20% service charge. Holiday Parties & Special Events: Host your celebration in one of our numerous private and semi-private spaces. We love helping with celebrations and business gatherings, from simple pre-ordered lunches for small groups to “overthe-top” shindigs for up to 400 people. We’ll serve our winter and holiday catering menus through January. To book your celebration, please call our events team at (336) 478-9111 or visit ohenryhotel.com or proximityhotel.com. Already have a venue for your event, but need a great place for your guests to stay? We offer special group rates. Call (336) 478-9111. Sundays | Skillet-Fried Chicken: Lucky’s is a popular Sunday supper spot. At Greensboro Lucky 32, our Skillet-Fried Chicken special is every Sunday starting at 3 PM, just after we quit serving brunch. At Lucky’s in Cary, we serve it up every Wednesday starting at 4 PM. We’ll dish up this popular favorite ‘til we run out! Tuesdays | Lucky 32 GSO – Songs from a Southern Kitchen: Impressive musicians light up the bar on Tuesdays from 6 – 9 PM. Plus, you’ll find value-priced wines and seasonal Southern snack options. What’s not to like? Performance schedule at lucky32.com. No cover charge! Wednesdays | Print Works Bistro – Mussels-Wine-Music: Rock out to fantastic covers and original lively music by AM rOdeO (Evan Olson and Jessica Mashburn). Also, enjoy delicious mussels (more for less, with our hand-cut fries) and six bottles of wines from $10 to $15 each. Wednesdays from 7-10 PM. No cover charge! Thursdays | O.Henry Hotel Lobby Cocktails & Jazz:Each Thursday night, we play host to talented musicians in our commodious, honeyed pine-paneled Social Lobby, and Green Valley Grill extends their bar into the lobby, offering full-service craft cocktails and seasonal Mediterranean tapas. Local legends Dave Fox (piano), Neill Clegg (various horns) and now Matt Kendrick (bass) perform with extraordinary vocalists. Thursdays from 5:30 – 8:30 PM. To see the performance schedule, visit ohenryhotel.com/jazz. No cover charge! Select Saturdays | O.Henry Hotel Jazz Series: Cocktails & Jazz at the O.Henry is so much fun that we asked the amazing Victoria and Neill Clegg to curate an expansion of the O.Henry Jazz scene. On select Saturdays, you can enjoy vintage craft cocktails and delightful seasonal tapas, along with an eclectic array of jazz artists performing in the varied styles of contemporary jazz from 6:30 – 9:30 PM. For an up-to-date performance schedule and to learn more about the artists, visit ohenryhotel.com/jazz. No cover charge! Arrive early for a seat! O.Henry Jazz Series Package: Includes one night’s gracious accommodations, preferred seating (we will save you a seat until the singers go on at 5:30 PM on Thursdays and 6:30 PM on Saturdays) at our O.Henry jazz performances, a $30 amenity voucher, a Southern-style breakfast for two and a late checkout. $279 plus tax and gratuities. 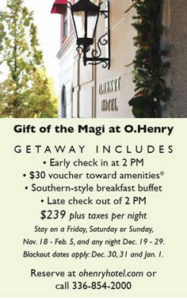 For a list of package dates and to book online, visit ohenryhotel.com/jazz or call 336-854-2000. Blackout dates apply, including New Year’s Eve. Sunset Hills neighborhood’s Christmas balls, Running of the Balls 5k and food drive. Gift Cards: Our restaurants offer gift cards available for purchase in our restaurants and online at qwrh.com. Customize a gift certificate for a hotel night’s stay (or choose from a variety of packages) for your lucky recipient by calling Proximity at (336) 379-8200 or O.Henry at (336) 854-2000. A fun, smaller gift idea: Consider ordering our Lucky 32 Southern Kitchen Voodoo Sauce (by the bottle or case) from our online store at qwrh.com, or pick up a bottle at Lucky’s, O.Henry or Proximity. 2017 Cooking Class Series: Need the perfect gift for a foodie? Print Works Bistro and Green Valley Grill Executive Chef Leigh Hesling will present six informative classes in 2017: three at Proximity Hotel (Feb. 18, Jun. 10, Sept. 9) and three at O.Henry Hotel (Mar. 18, Jul. 29, Oct. 28). Start with a seasonal cocktail during the cooking demonstration, then savor a three course meal paired with some amazing wines. Tickets are $80 per class, or purchase a three-class package for $225. For tickets, order from our online store at qwrh.com or contact Lee Healy at (336) 478-9126 or lhealy@qwrh.com. Turn these Saturday classes into a culinary-immersion weekend and stay overnight. * Vouchers can be used at Print Works Bistro, Green Valley Grill and Lucky 32 Southern Kitchen and other hotel amenities. 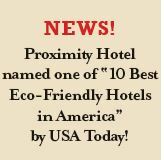 For room reservations and to learn more about our New Year’s happenings, visit proximityhotel.com or call Proximity at (336) 379-8200. To reserve a table, visit printworksbistro.com or call (336) 379-0699. Cheers to 2017 Package: Check in extra-early (at noon) and unwind with housemade treats and sparkling wine in your comfortably appointed loft-like room. Take advantage of priority dinner reservations at Print Works Bistro, then join the New Year’s Eve Pop-up Dance Club from 10 PM – 1 AM. The next morning, enjoy breakfast in bed and an extra-late checkout of 4 PM. $334 plus tax. Stay an additional night for only $149 more. Breakfast in bed and dinner reservations are based on availability. 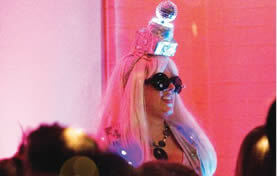 Print Works Bistro New Year’s Celebration: Order from a special four-course prix fixe menu or our full dinner menu, plus get your groove on at our Pop-up Dance Club at 10 PM featuring DJ Jessica Mashburn. The party won’t stop until 1 AM. No cover charge! January 1, nosh on brunch from 7:30 AM – 4 PM. For room reservations and to learn more about our New Year’s happenings, visit ohenryhotel.comor call O.Henry at (336) 854-2000. To reserve a table, visit greenvalleygrill.com or call (336) 854-2015. Ring in the New Year Package: Celebrate with a bottle of sparkling wine and delish housemade sweet treats in your guestroom after an extra-early (noon) check-in. Enjoy priority reservations at Green Valley Grill, then watch the arrival of 2017 in your room, snuggled up with your honey, or come to the lobby for Jazz. The next day, enjoy breakfast in bed and an extra-late checkout of 4 PM. 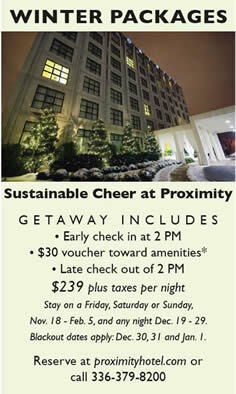 $334 plus tax, and stay an additional night for only $149 more. Breakfast in bed and dinner reservations are based on availability. Greensboro Symphony Package: Package includes a $30 credit toward dinner and two tickets plus transportation to and from the Symphony’s “A Webber and Rodgers & Hammerstein Broadway Celebration.” On your return, find housemade chocolate truffles and sparkling wine in your room. The next morning, enjoy a full Southernstyle breakfast buffet and a late checkout of 2 PM. $329 plus taxes and gratuities. New Year’s Eve at Green Valley Grill: We’ll serve our full dinner menu, plus a special four-course prix fixe menu, and the bar will be open until 1 AM. On January 1 we’ll serve brunch from 9 AM – 4 PM. New Year’s Jazz at O.Henry: We’re hosting two performances on New Year’s Eve in the Social Lobby for those who want to celebrate early (Dave Fox and Jessica Mashburn from 5:30 – 8:30 PM) or late (Randy Craven and Sheila Duell from 9:30 PM – 12:30 AM). No cover charge! On December 31, we’ll serve a special menu along with our full dinner menu until 11 PM, and the bar and grill room will be open until midnight. On New Year’s Day, we serve “good luck” food like collard greens, country ham with red-eye gravy, grilled pork loin chops and Hoppin’ John. You can also order New Year’s Day-to-Go online at lucky32.com. More than anything else, our restaurants and hotels are about the people who choose to join us, sharing our intention of being of genuine service to our guests and colleagues. Please consider referring folks to us who you think might find joy in the professional dimension of their lives by playing a role with QW. For more delicious recipes from our kitchens, visit lucky32.com, greenvalleygrill.com and printworksbistro.com.